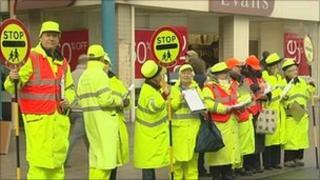 Lollipop men and women in part of Suffolk have taken to the streets to protest at moves to axe school crossing patrols. In December, Suffolk County Council proposed abolishing its school lollipop crossing service with the loss of 62 jobs to save £174,000 a year. Crossing patrol staff went to Lowestoft town centre to collect signatures for a petition against the plan earlier. The Conservative-run council is due to decide on the matter next month. Lollipop lady Lian Shepherd said lives could be put at risk if the service was cut. "The service is there to protect the children," she said. "The traffic is absolutely lethal. We need to make sure someone is always there to help them across the street." The council said it appreciated the commitment of crossing patrol staff but service cuts were needed to help it save a total of £125m over the next two years.